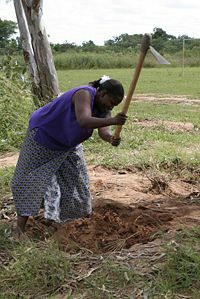 Subsistence farming, or subsistence agriculture, is a mode of agriculture in which a plot of land produces only enough food to feed the family or small community working it. All produce grown is intended for consumption purposes as opposed to market sale or trade. Historically and currently a difficult way of life, subsistence farming is considered by many a backward lifestyle that should be transformed into industrialized communities and commercial farming throughout the world in order to overcome problems of poverty and famine. The numerous obstacles that have prevented this to date suggest that a complex array of factors, not only technological but also economic, political, educational, and social, are involved. An alternative perspective, primarily from the feminist voice, maintains that the subsistence lifestyle holds the key to sustainability as human relationships and harmony with the environment have priority over material measures of wealth. Although the poverty suffered by many of those who have never developed beyond subsistence levels of production in farming is something that needs to be overcome, it does appear that the ideas inherent in much of subsistence farming—cooperation, local, ecologically appropriate—are positive attributes that must be preserved in our efforts to improve the lives of all people throughout the world. Subsistence farming is a mode of agriculture in which a plot of land produces only enough food to feed those who work it—little or nothing is produced for sale or trade. Depending on climate, soil conditions, agricultural practices and the crops grown, it generally requires between 1,000 and 40,000 square meters (0.25 to 10 acres) per person. A recognizably harsh way of living, subsistence farmers can experience a rare surplus of produce goods under conditions of good weather which may allow farmers to sell or trade such goods at market. Because such surpluses are rare, subsistence farming does not allow for consistent economic growth and development, the accumulation of capital, or the specialization of labor. Diets of subsistence communities are confined to little else than what is produced by community farmers. Subsistence crops are usually organic due to a lack of finances to buy or trade for industrial inputs such as fertilizer, pesticides or genetically modified seeds. Subsistence farming, which today exists most commonly throughout areas of Sub-Saharan Africa, Southeast Asia, and parts of South and Central America, is an extension of primitive foraging practiced by early civilizations. Historically, most early farmers engaged in some form of subsistence farming to survive. Within early foraging communities, like hunter-gatherer societies, small communities consumed only what was hunted or gathered by members of the community. As the domestication of certain plants and animals evolved, a more advanced subsistence agricultural society developed in which communities practiced small-scale, low-intensity farming to produce an efficient amount of goods to meet the basic consumption needs of the community. Historically, successful subsistence farming systems often shared similar structural traits. These included equal access to land plots for community members as well as a minimum expenditure of agricultural labor to produce subsistence amounts of food. Over time, the loss of such freedoms forced many subsistence farmers to abandon their traditional ways. In early twentieth-century Kenya, a lack of land access due to the commercialization of certain farmland plots by British colonists forced Kenyan communities toward commercial farming. Consistent surpluses, like those experienced by nineteenth century South Africa and sixteenth century Japan, also encouraged commercialized production and allowed farmers to expend more amounts of agricultural labor on certain produce goods that were strictly intended for trade. Though forms of subsistence farming are believed to have been practiced by most early civilizations worldwide, over time, as population densities rose and intensive farming methods developed, the movement toward commercial farming and industrialization became more prominent. For countries like Botswana, Bolivia, Rwanda, Sierra Leone, Zambia, Mexico, and Vietnam, however, subsistence farming continues to be a way of life far into the twenty-first century. In the absence of technology, the area of land that a farmer can cultivate each season is limited by factors such as available tools and the quality of the soil. Tools used by subsistence farmers are often primitive. Most farmers do not have access to large domesticated work animals, and therefore clear, toil, and harvest their goods using pointed sticks, hoes, or by hand. Techniques of subsistence farming include "slash and burn" clearing in which farmers clear plots of farmland by cutting down all brush, allowing the debris to dry, and later burning the fallen refuse. This works to clear the field for cultivation, while the leftover ash serves as a natural fertilizer. This type of clearing technique is often employed by subtropical communities throughout lush areas of South and Central America, and parts of Indonesia. If the land does not produce a surplus, due to the fertility of the soil, climate conditions, tools and techniques, or available crop types, the farmer can do no more than hope to subsist on it. Under these conditions, subsequent years with poor harvests often result in food scarcity and famine. Not all subsistence farmers have access to as much land as they can cultivate. Many times, socioeconomic conditions prevent an expansion of farming plots and any increase in produce levels. If inheritance traditions require that a plot be split among an owner's children upon the owner’s death, plot sizes steadily decrease. Many techniques have been attempted, with varying degrees of success, to help subsistence farmers to produce consistent surpluses so that small underdeveloped communities can begin the path toward commercial farming, and economic development. 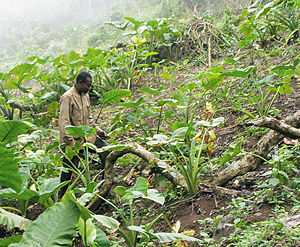 Education about modern agricultural techniques has proven to have limited success in areas practicing subsistence farming. Since subsistence communities often lack the basic infrastructure for industrial growth, a second approach to education has been to provide community farmers with non-agricultural marketable skills. Under this approach, subsistence farmers are given an opportunity to leave the subsistence community to seek employment in an area where greater resources are available. This technique has been met with marginal success as it often ignores the human desire to stay within one’s own community. Attention has also been given to developing underutilized crops, particularly in areas of Africa and South-East Asia. Genetically modified crops, such as golden rice, have also been used to improve productivity within subsistence communities. Such crops are proven to have higher nutrient content or disease resistance than natural varieties, and represent an increase in farming efficiency. This technique has been highly successful in some parts of the world, although long-term ecological and epidemiological effects of these crops are often poorly understood. Proper irrigation techniques can also dramatically improve the productivity of subsistence farmland and have been introduced to certain rural communities in hopes of promoting output surpluses. Traditional irrigation methods, if in place, have been shown to be extremely labor-intensive, wasteful of water, and may require a community-wide infrastructure which is difficult to implement. A variety of programs have helped to introduce new types of irrigation equipment available which are both inexpensive and water-efficient. Many subsistence farmers, however, are often unaware of such technologies, are unable to afford them, or have difficulty marketing their crops after investing in irrigation equipment. Microloans, or government loans of small sums of money, have also been shown to enable farmers to purchase equipment or draft animals. Alternatively, microloans may enable farmers to find non-agricultural occupations within their communities. Peruvian economist Hernando de Soto has argued that one obstacle to industrial development is that subsistence farmers cannot convert their work into capital which could ultimately be used to start new businesses and trigger industrialization. De Soto has argued that these obstacles exist often because subsistence farmers do not have clear ownership titles to the land which they work and to the crops which they produce. In addition to the problems presented by undefined property rights, monetary demands on industrial producers, like produce taxes, often dissuade subsistence farmers from entering the commercial farming sector. Moreover, the marginal benefit of surplus production is limited, and any extra effort to increase production is poorly rewarded. Subsistence farmers in underdeveloped countries often lack equal access to trade markets. Despite attempts to specialize in the production and distribution of certain crops, many subsistence communities still lack access to open market systems in which the sale or trade of such goods are possible. In addition, educational studies have shown certain industrial growth techniques to depend on various infrastructures, climates, or resources that are not available in all communities relying on subsistence farming. In this way, subsistence farming may represent the only way many deeply rural communities can survive. Despite its difficulties, subsistence farming remains a part of the modern world today. For many underdeveloped nations, subsistence farming represents the only option to prevent starvation and famine. Subsistence farming has been argued to be economically efficient within various subtropical regions of Columbia and Papua New Guinea. Under these subtropical conditions, rainfall levels are often high and various crops can be produced year round. Due to these conditions, production levels often prove adequate enough to provide for small subsistence farming communities. This argument does not hold for many Sub-Saharan regions of Africa, where poverty and famine levels are some of the highest in the world. One reason why subsistence farming systems have failed throughout the Sub-Saharan region are increasing trends in population growth that are not met with an equal increase in the production of agricultural output. Other reasons include unusually harsh climate conditions, widespread disease among plants and animals, and a lack of efficient institutional structures. In parts of rural Zambia, much of the current population relies on subsistence farming to survive. As irrigation systems are few, most Zambians must rely on seasonal rains to ensure crop production. In 1995, Zambia underwent a severe drought which vastly diminished production levels throughout traditional farming communities. Similar impoverishment has been observed throughout parts of the Amazon Basin of Brazil and the Indonesian islands of Sumatra and Borneo, which also rely heavily on subsistence farming and production. Many developmental economists have argued against the use of subsistence farming and instead promote commercial farming and economic industrialization as the solution to worldwide hunger. Economist Ronald E. Seavoy, author of Subsistence and Economic Development (Seavoy 2000), argued that subsistence farming is to blame for high levels of poverty and increasing instances of famine, recommending the transformation of subsistence agriculture into commercial agriculture which would ultimately promote economic development among economically underdeveloped nations. Attempts have continued to be made to move in this direction away from subsistence farming. In central Uganda commercial farming has been promoted to alleviate high poverty levels throughout Ugandan subsistence farming communities. Restructuring the production output of the people and identifying a potential market for free trade, are key to successful small-scale industrialization, thereby improving rural living conditions and diminishing poverty rates. An alternative viewpoint, particularly promoted by women often called "ecofeminists," reflects the need to understand sustainable economies. Those such as Maria Mies (Bennholdt-Thomsen & Mies 2000) and Vandana Shiva (1989) have argued that the free market capitalist system is inherently unsustainable in the long run, since it exploits various population groups and the environment. Instead, they argue that the "catch-up" model of economic development, assuming that western-style progress is possible and optimal for all, be replaced with a more ecologically sensitive approach, valuing harmony with nature and the goals of happiness, quality of life, and human dignity over the accumulation of wealth. They explain subsistence as empowerment for all, based on people's strengths and their cooperation with nature and each other. Subsistence farming as practiced in many parts of the world in the past and today is not the ideal model. Nonetheless, subsistence farming generally recognizes the cycles of renewability in nature and works in harmony with them to maintain productivity. Ultimately, sustainability depends upon harmony among people and with our environment. There are lessons to be learned in this regard from the subsistence perspective. Roosevelt, Eleanor. Subsistence Farmsteads Forum 91 (Apr. 1934): 199-201. From the Eleanor Roosevelt Papers Project, 1934. Retrieved August 11, 2007. Seavoy, Ronald. Subsistence and Economic Development. Westport, CT: Praeger Publishers, 2000. ISBN 0275967824. This page was last modified on 2 April 2008, at 17:08.